Don’t have any cream of tartar? Don’t worry, you can make playdough without cream of tartar. A typical recipe with cream of tartar is this cream of tartar playdough recipe. Set it to low heat and stir. When dough forms, remove it from the heat. Allow to cool and then enjoy! 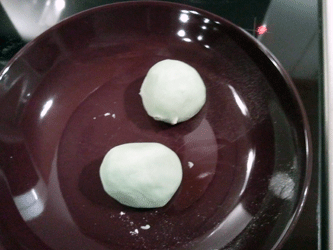 Another simple playdough recipe that provides some amazing results. 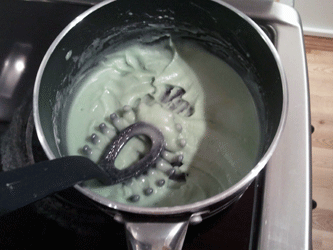 If you want something really quick and simple, don’t use food coloring. The short version of the recipe is simple enough, but if you feel like you need a step-by-step explanation with images, here it is. We begin with collecting the ingredients. Here you can see the water, flour, salt and food coloring. All we need for this specific playdough recipe. In the pan where you plan to cook the playdough, mix all ingredients. 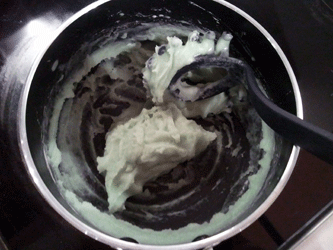 It should look something like this, depending on how much food coloring you want to use. Just pour it in there and mix together. Start heating the mixture on medium heat, it’s important that we don’t burn it. After a minute or so it should look like this. A bit more doughy but nowhere near finished. Now you will be able to see that the mixture changes quite rapidly. To make sure you don’t burn it you can lower the heat some. After quickly changing and when finished it should look like this. Remember that it’s a bit hot, but it cools rather quickly. When cool enough, remove the finished playdough from the pan and start making your creations. My finished playdough looked like this. Because of all the salt in the playdough, it will dry out your skin, so remember lotion after handling it. Good luck with your own playdough cooking, I’m certain it will turn out great! Where do I find glow-in-the-dark powder? You can find it here: Green Glow Pigment Powder 1oz- Green Glow in the Dark I linked to green powder but there are many different colors. could you add koolaid to this instead of food coloring and how long does it last? I haven’t tried, but please let me know how it turns out if you try it. The standard recipe is good for a couple of weeks or so, stored in airtight container. I made this tonight with my 4 year old and 5 year old daughters. It was great. We only had enough salt on hand to make half the recipe but it worked out great. I was pleased to show them that we can make things at home and don’t have to buy everything. I am finding it quite sticky when I make it. Am I doing something wrong? It’s basically good as long as it’s not smelling and it’s functioning as playdough. Keeping it in an airtight container in the fridge will make it last longer. It should be good for a couple of weeks or more. Mine turned out super sticky as well. I have added a ton of flour. I’m going to try less food coloring to see if that helps. Try some more salt as well, it absorbs water. Alternatively a bit less water. I go through a lot of playdough with all my children. But i have found that this recipe works the best and takes 5 min. boil 2 cups of water either in your kettle or just through you water cooler if you have the hot water feature. 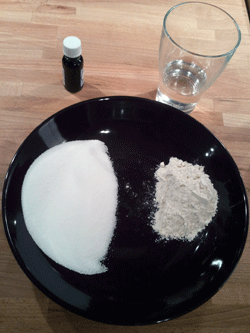 To this water mix in 2 pkg of cool-aide drink mix, 2TBSP oil, 1 cup salt, stir until dissolved. 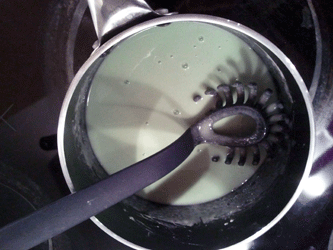 Add your 2 cups of flour and if you want 1 TBSP creme of tarter, or alum, neither is neccessary. stir then turn out onto your table or if you have a ceramic top oven it doesn’t stick.. kneed until all incorporated. if you find a little sticky add a bit of flour as you go. At christmas time i make a gingerbread playdough with brown cake gel for color and add gingerbread cookie spice. You can add sparkles, glitter, and mix away. My kids love it. Give it a try, it might actually work, I’ve never tried myself. Just made this X2, it was awesome!! I worked through a little extra flour and didn’t add as much salt and it’s perfect. Thanks for a great recipe!!! What does the Alum or creme of tarter do or not do when added to playdough? I see some recipies have it and others don’t? Anyone know why? Could probably try adding hand lotion instead of oil. My guess is that you don’t let enough of the fluid boil/simmer away. Keep it in the pan for just a bit longer. I’m very nervous to make this. I believe I’ve made another version of this before, but it didn’t call for any cooking. As like everyone else though, it was very sticky and stained my hands. Do you have any suggestions? Make sure you boil awayas much of the water as possible and add extra flour if needed. The food coloring will stain your hands, try using plastic gloves. omg it worked out i am so happy!!!!! Hello, the dough will always be sticky unless cream of tartar is being used. Think the alum is a preservative and cream of tartar for extra elasticity, that’s why you don’t necessarily need them. I’m going to try this with the less salt, my daughter has a habit of mixing the colours of shop bought ones. This recipe worked great, but I recommend adding 1 cup of flour and only 2 TBSP salt. I also added tatar which made it nice and stretchy…FUN! Never mind. It is working now. I love it! very sticky. how can i fix this? I just made several batches of this and found that I had to use a total of 3 cups flour and 2 cups salt for every 2 cups boiling water. I also added 2 Tbsp oil because the other recipe I was using before I stopped adding cream of tartar called for it, and I’m assuming it must have something to do with the dough staying soft longer. We’re going to try this out to make models of earth’s layers tomorrow in our co-op class, so I’m hoping it works out ok! Seems like a good consistency so far. I’ve never made playdough before and mine came out really sticky. Not sure if it needed more cooking or more flour. After reading some comments I might try even more flour. We also added a couple of drops of essential oils.